We all have to get into a college someday! You might hate studies to an extent that you just want to throw your school books out of the window, you might be someone interested in sports or the real world, you might even be someone who has his future set with loads of ancestral money, (probably you don’t have so much money!) but you have to get a degree! No matter it’s a diploma or a Ph.D., its as simple as that: “You need a degree!” There’s no reason to ask why! The world demands a qualification, and if you don’t have it, you are already out of the race! At least, wouldn’t it satisfy you that you will be proudly addressed with your qualification someday? Times have changed now! To climb the ladder of corporate success, you can’t avoid having a degree! You are ready to have a degree, you are ready to pursue your dream, you are ready to get into the college life, but one thing stops you! Which college should I choose? That’s a big question indeed! There exist a big flock of colleges in today’s time, having different facilities, different courses, and different budgets. There are around 2000 B.Tech Computer Science colleges in India alone! It would be unreliable to get into a college just be hearing word of mouth! You can’t even browse for each and every college’s website only just to choose the best! Their website’s design can’t be used to judge the college, right? Okay, enough of this talk! Let me show you the solution to this common problem: It’s COLLEGEDUNIA.COM! Well, it’s basically an easy-to-use website that will guide you to pursue the degree from the college of your needs! Interested? Let’s talk more about it then! CollegeDunia Review: Find Colleges Online! 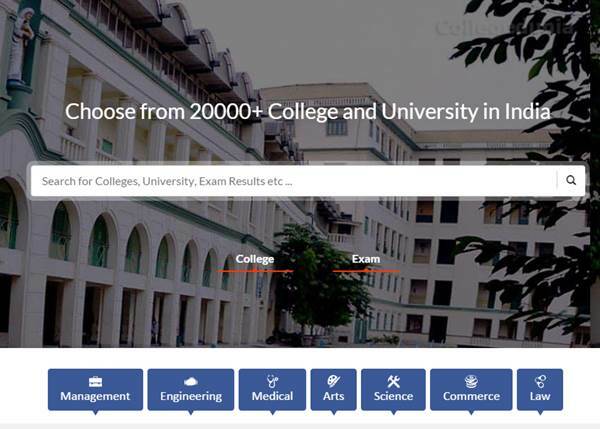 CollegeDunia is basically a website which lets you browse through the colleges in India, compare them, and find the one which suits you the most! – As simple as that! It’s from where you can unlock the key to thousands of colleges, compare them, contact them and get in! As you can see, you can browse via degree, location, sub-categories and what not? Or, you can just enter the name of the college and get to know what’s in it! Ask yourself, will you get such info by Googling it? Yes, you will feel a lot comfortable while browsing through CollegeDunia! The design is sleek, you will like to visit this website again and again! Being simple is their rule of thumb – It is probably the simplest site of that kind! And, as an additional bonus, you will get access to their blog, which includes practical info on how to apply for certain colleges, tips, news etc. There’s still more! You can sort colleges by their ratings to get into the best one! You can also download any college’s brochure and get their contact details from here itself! Needless to say, it’s the best of its kind! What about Placements? Can I find Placements too? Yes you’re dead on right. CollegeDunia.com let you companies that visited a college and offered placements there. 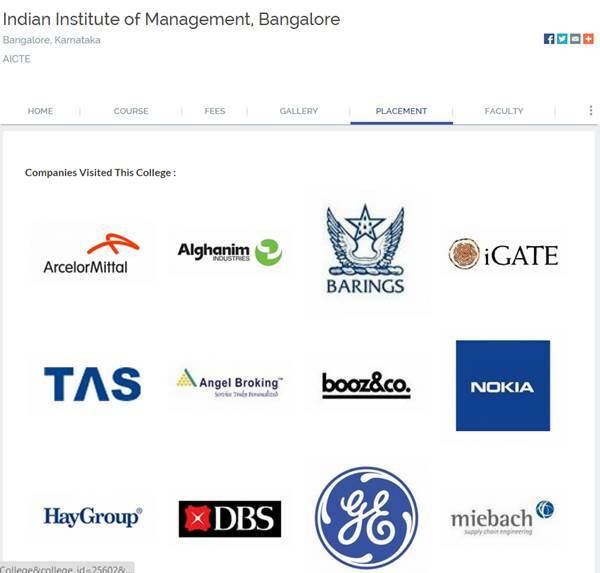 Suppose you want to pursue management course from IIM Bangalore and what to know about companies that offer IIM B Placements, you can do that too. See the screenshot below. What if you wanted to know the fees required to pursue a certain course in IIM Bangalore, then CollegeDunia.com will help you in that too. No doubt, CollegeDunia is filled with all the required and unique features to find the best College of you needs! Their simple design adds up as an asset and makes the experience even better! So, what are you waiting for? Find the college of your dreams, NOW! Yes this is the great site for college finder. let me give you another suggestion. The perfect destination for architecture college in bangalore. “Aditya Architecture colleges in bangalore” is the best college for B.Arch courses in south india.